Ethernet over Power (EoP) is a technology for sending network data over power lines in a building. 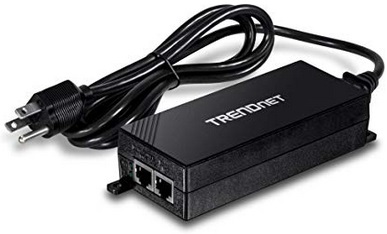 A device called an Ethernet over Power EoP adapter plugs into a wall outlet, an Ethernet cable from your modem or bridge is plugged into the LAN port on the adapter. Network devices can then be plugged into EoP adapters in wall outlets throughout the building. This eliminates the need to run Ethernet cables through the walls of the building. Of course you could use wireless technology to eliminate the need to run cables, but then there is the security problem of your network signal being available outside the walls of the building. EoP adapters have builtin encryption for network security and data protection. The ability to run Ethernet over power lines, even though the power line voltage is 120 volts and the Ethernet voltage is only 5 volts, is the result of the power line frequency being extremely slow (60 Hz) relative to Ethernet signal frequency (500 MHz). 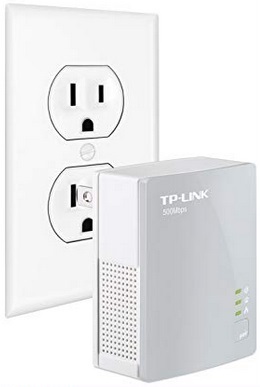 This means that the Ethernet signal can run on top of the power line signal without much effect on powered devices, while the 120 volt level can be filtered out of the Ethernet signal. Power over Ethernet (PoE) is a technology for sending power over Ethernet network cables. Sometimes a device needs to be installed in a location where there is no power outlet. This is particularly common when placing wireless access points or IP security cameras. Ethernet network cables, such as Cat 5e and Cat 6, are comprised of eight wires arranged as four twisted pairs. In 10BASE-T and 100BASE-T Ethernet, two of these pairs are used for sending network data. The other two pairs are unused and are retained as spare pairs (Gigabit Ethernet uses all four pairs). A device called an Power over Ethernet PoE adapter plugs into a wall outlet. An Ethernet cable is plugged into the LAN port on the adapter. The PoE adapter reduces the power line voltage to typically 48 volts and injects it onto the unused pair in the cable. Because electrical currents flow in a loop, two conductors are required to deliver power over a cable. The IEEE has been defining PoE standards. IEEE 802.3bt 4PPoE released in September 2018, introduces power type 3 and type 4. At 48 volts, type 3 can handle a current of up to 600 mA, and type 4 can handle a current of up to 600 mA. The device receiving the power must be within 100 meters of the adapter providing the power. While the other pairs in the cable can still be used to cary the Ethernet data signal.